Football: I'll title this story (one, no doubt you've heard before) as . . . "Up the middle, Up the middle, Pass, Punt". During the week prior to a Saturday football game, the football coaches and team would study film (yes, film) of our upcoming opponent's previous games. From this, the coaches would develop specific offensive and defensive strategies and plays to counter what we observed in the film. We refined the strategy and practiced those plays during the week in preparation for Saturday Game Day! 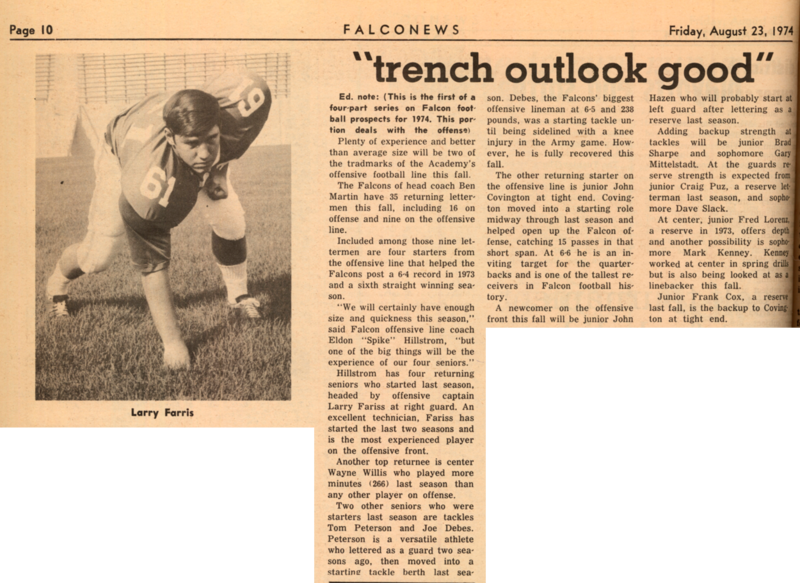 As you all know from watching those games on Saturday, we went right back to that which the Falcon offense had became famous (see title of this story). The upcoming pass play fooled no one and usually resulted in a desperation throw to avoid the sack by one or two blitzing linebackers. I'm sure it frustrated the fans. You can't imagine how it frustrated the players. 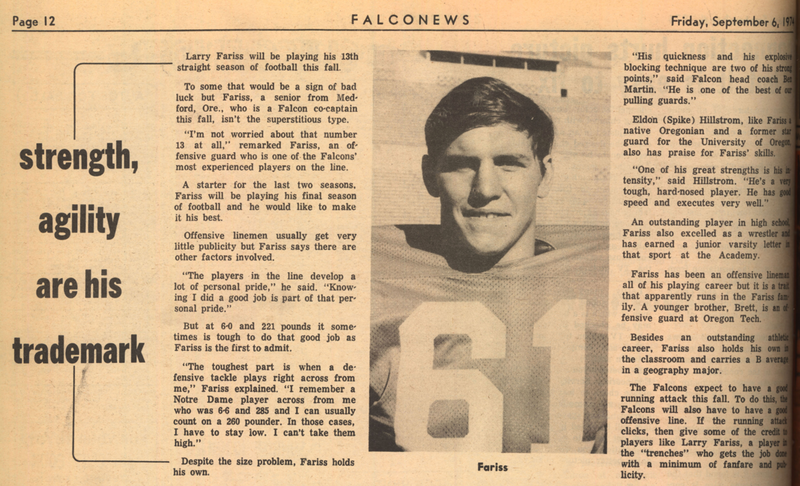 Bob Farr and I were the Falcon wide receivers. At the completion of our pass routes we usually looked back only to find the quarterback running for his life. During one game . . . forgive me, I'm old and can't remember which one . . . the Falcon offense found its way to a first-and-goal situation from about the five yard line. 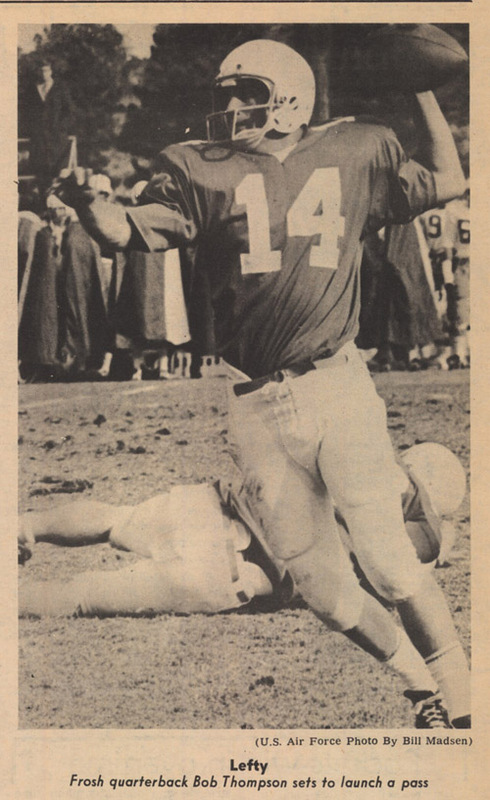 Our quarterback, Mike Worden, called the play that Coach Terry Issacson (All-American, AFA '64, I believe) signaled in from the sideline (see first part of title for play called). On second-and goal from about the five, the coaches sent in a substitute for me. I'm thinking, "Great! The coaches are sending in a play that we practiced this week for this specific situation!" (see second part of title for play called) only, the play was called off tackle, not quite "up the middle." On third-and goal from about the five, the coaches send me back into the game with the next play to be called . . . another running play. I think my frustration got the better of me. I changed the play to a pass play, which we had practiced during the week, before I got to the huddle. Bob is split wide. I'm in the slot. We ran a crossing pattern to "pick off" each other's defender. Mike spotted the open receiver (Bob, in this case) and threw a perfect spiral for a touchdown. The Fans Go Wild! Football: And here I thought Bready’s shining moment of AFA football lore was the ball bouncing off of his helmet on national TV during a punt in the Notre Dame game! Al is correct though . . . it was hugely discouraging in the standswatching the offense run-run-pass-punt. I remember as a Doolie, my best friend and I were up in the stands grousing about the play-calling, only to be jumped on (can't remember if it was an officer or upperclassman) about being disloyal, yadda, yadda, yadda . . . But game days were still my favorite times during all of those years (and hockey nights) . . . just a wee bit of normalcy inside the asylum. Football: One cannot think of Al Bready without remembering Thanksgiving Day, 1973, in Notre Dame Stadium, on National TV. It was a beautiful clear November Day with a cloudless sky. Al was in deep punt formation ready to receive a punt (I think the only Notre Dame punt of the day) when the kicker boomed a high, hanging kick. Al settles under it, ready to make the catch, put a spectacular move on the defenders, and run into Falcon glory returning the punt for a touchdown . . . on national TV!! However, as I said, it was a cloudless sky, and as Al settled under the ball, he lost it in the blinding sun. He desperately searches for it . . . and it finds him, right in the middle of his helmet. The ball bounces at least 10 feet in the air, and Al, except for his helmet, never touches the ball. To add insult to injury, the national TV audience was given at least three replays of "Al's moment in the sun". Spirit: Several Class of ’75 members assist a West Point Cadet during the Air Force-Army game, 16 October 1971. Final score Air Force 20 Army 7. Soccer: About those "Flashbacks/Nightmares" . . . I successfully got rid of them for about 20 years until . . . YOU GOT ME RE-CONNECTED again with USAFA. Curses on you Jim, Curses! I have three that are recurring: 1. I'm wandering the dorm halls looking for my squadron and room, neither of which I know (guess the senior shuffle did a number on my psyche); 2. I don't know if it's an "M" or "T" day and what classes I need to go to; 3. I'm face-to-face with the Soccer Coach ready to throw punches, arguing he needs to play to win and not field his pretty boys who lose (the coach fielded mostly underclassmen). The coach had kicked 75ers Wojcicki & O'Shea off the team before the season started; Bentley went military; Zerambo got shafted and hung up the spikes; Shine & Narzinski were "invited to leave" the team for disagreeing with the coach. Jack took him up – I stayed and continued to argue and was consequently made to ride the bench halfway through the season for much of the rest of that season. 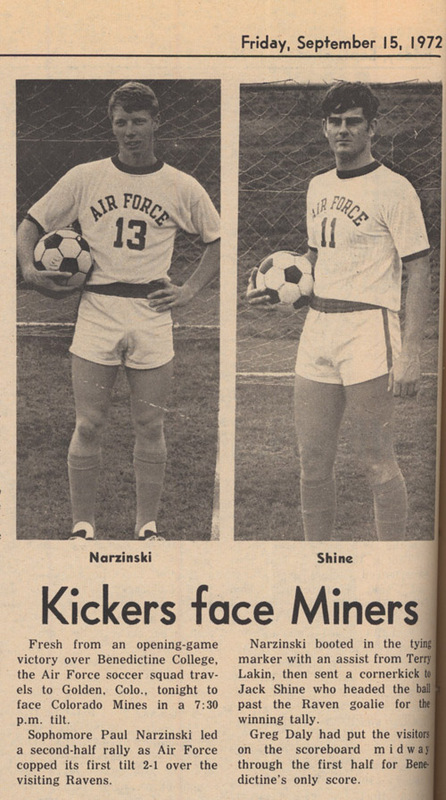 Funny, but my Junior Year I made All-League – and invited, with Lenny Salvemini, to try out for the 1976 Olympic Soccer Team (he made it). My Senior year, I was made to ride the bench. 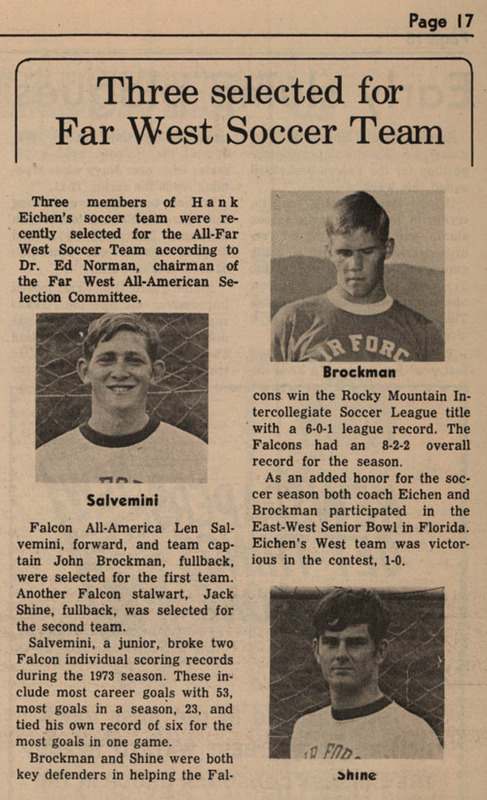 Our Senior year was the first year, ever, USAFA had a losing soccer season. What a coach . . . what a legacy. The first two nightmares I wake up in a sweat, the third one I wake up angry (once almost hit my lovely wife). Guess now it will take another 20 years to get rid of these . . . maybe I should start therapy?! Who Played in NCAA Championship Tournaments? Narz is right . . . the 1974 Water Polo team did make it to the NCAA tournament of eight in Long Beach CA. '75ers were indeed Phillips, Calhoun, & Magee . . . we had a great year! Bruce Edstrom and I went to NCAA finals Firstie Year.